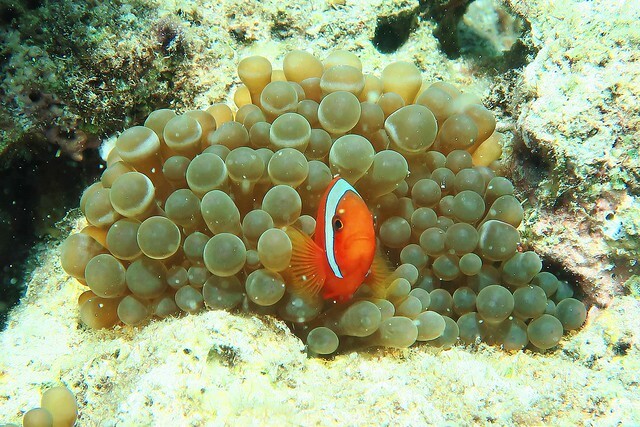 One thing I like about the clownfishes is that whenever you are looking at them through your dive mask, they will know it and they will come out of their seemingly comfortable anemone to check you out, literally. They make such good subject for taking pictures and I have tons of them using my G7X with Ikelite housing and this particular image always catch my eye whenever I browse through my pictures because of the composition and the position of the clownfish is just right in the center of the anemone. This was taken during my dive in Talima Marine Sanctuary, Cebu, Philippines with absolutely great water condition. When we were just cruising around in the water depth of approximately 18 meter, I spotted my first bunch of striped catfishes and I was so excited that I finned my way quickly towards them. First wrong move, I scared them away and they dispersed right even before I can even compose my shot! 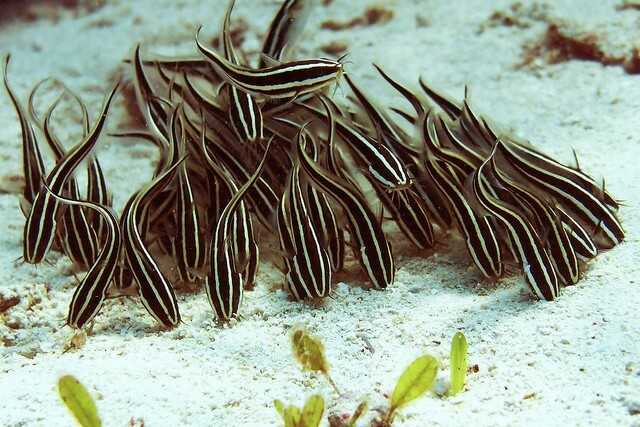 Learning my lesson, I hang around the same spot for the school of striped catfishes to gather again and start gazing on the sand as a bunch. I approached slowly and was finally ready to click on my shutter button on my G7X, I breathed in then out. Second wrong move, as bubbles gushed out of my regulator, the catfishes dispersed, again. I was indeed amazed at how sensitive the catfishes can be. I was definitely more than an arm’s length away from them and I had to zoom in on them to compose my shot. Luckily, I was at the beginning of my dive and I still can afford to hang around again while waiting for them to gather again. This time, I was really careful and creep up to them as close as I can and held my breath while pressing on my shutter button repeatedly so that I would have more pictures to choose from. After adjusting the image and a little cropping, I have finally found the picture I really like a lot. It’s not bad for my first try of capturing the little striped catfishes that were no longer than my thumb. Thumbs up for G7X with Ikelite housing! 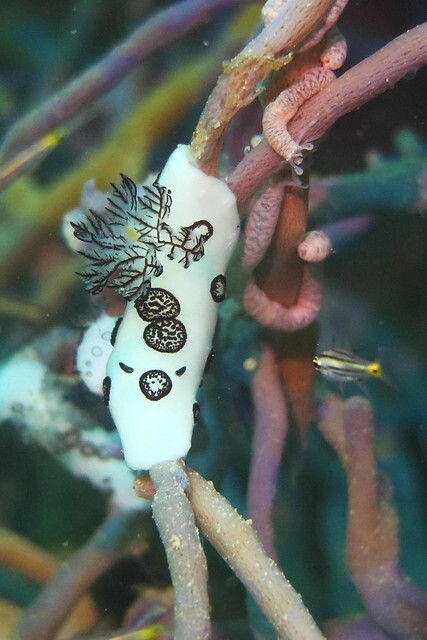 This is definitely my very first time having such close encounters with so many panda nudibranch while diving in one of the shipwreck in Coron, Palawan. It was a great experience to be encountering so much marine life in the water around and in the shipwreck, very interesting dive and the shipwreck dive is indeed popular and well-known in Coron, Palawan. I used G7X in Ikelite housing and used the nature light source for capturing this image of a big and elegant panda nudibranch. 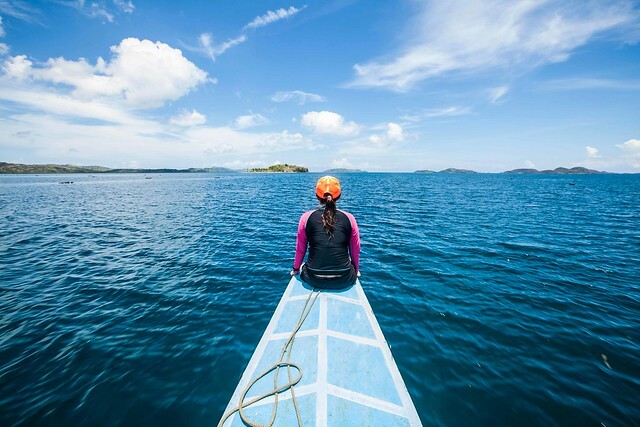 The moment our boat leaves the port of Coron, Palawan, I realized just how calm can the open water be. Out in the sea, as our boat glides through the water for almost half an hour, I decided to pick up my camera and start composing my shot from the bow of the boat, the calm sea made it so easy for me to just stand on the bow of the boat without any fear of dropping myself and my precious camera into the water. It was indeed an absolutely great experiences for me to be able to capture the reflections of the sky on the open water out in the sea. Incredible! Talking about serenity, I really enjoyed the whole morning I spent on the boat ride which was such a smooth one. Other than the cruise ships I have taken before, this is the next smoothest boat ride I have experienced and moreover, the boat we were on was just a small one. Overlooking one of the island we passed by, I composed my shot on it so that my horizon line can be broken with a prominent foreground. With the beautiful cloud formation, I made my shot and captured the image where I can look back in time. So long you are a beach lover, you will find that Pass Island is a beautiful island and there is no doubt about it that you will love it there either! In fact, the thought of staying overnight on the island has actually crossed my mind. There are small cottages on the island that you can rent to stay overnight but there are so few cottages there that everyone who stays there for the night will have their own spaces leaving one another the tranquility that the island offers. 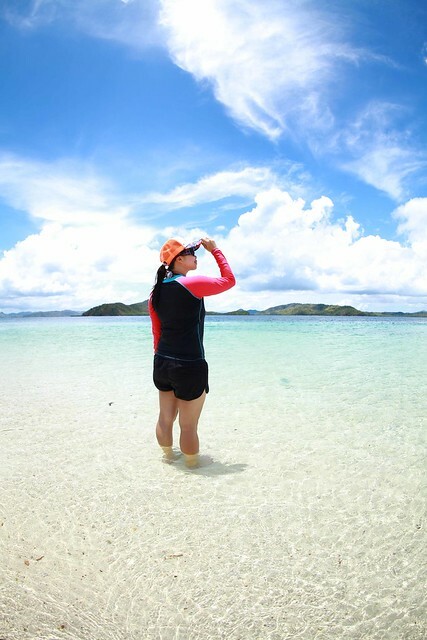 We all loved the sun, sand and the sea with great sunny weather at Pass Island during our short stay there during our island hopping of the day. We were definitely very fortunate to have such a nice weather to be at Pass Island. We did not expect that the Pass Island, which is not very well known to tourists, to be such a beauty with its tranquility in place! Surrounded by crystal clear and shallow water, this small island surprised us when we stopped by for our day of island hopping and almost immediately, we decided that we will stay at the Pass Island for our lunch and spend more time indulging ourselves in the sun, sand and the sea! The crystal clear water on the beach is so shallow that you can see right through the water to the sand below with the water at our waist level. The water is so calm that it was definitely not easy resisting the temptations jumping into the water for a swim or snorkeling! You will never get tired of the white sandy beach and the crystal clear water glittering like thousands of diamonds right in your eyes. 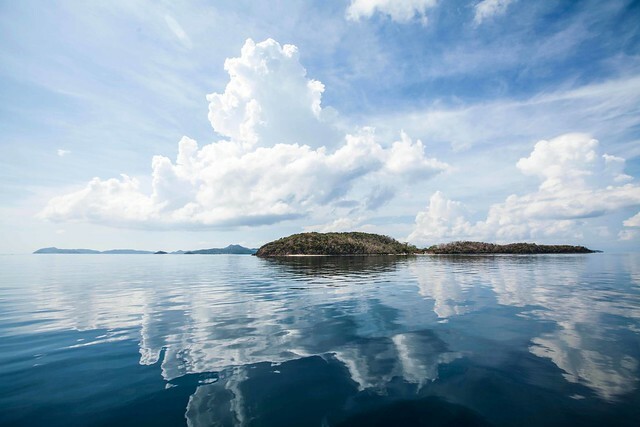 With the great weather, the Pass Island is definitely a beauty to visit and wonderful experiences will be expected. The image below was made by me when I went into the water till knee deep and I knelt down into the water to get a closer composition of the crystal clear water with the rock formations far behind under the beautiful sunny weather. As the pump boat cuts through the glittering blue water as we were making our way for our island hopping activities for the day, we took time to indulge ourselves in the gorgeous view of the beautiful rock formations that surrounded us. 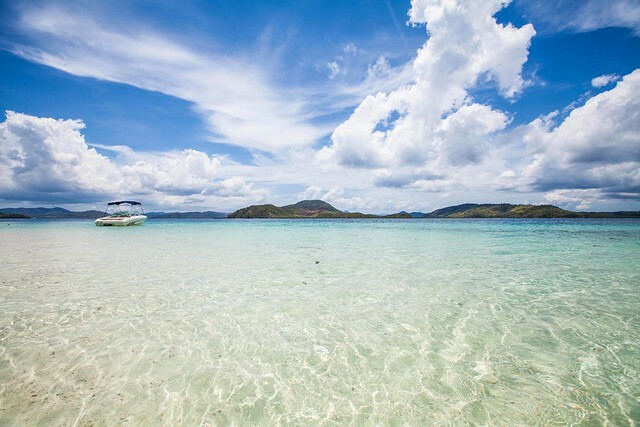 With such beautiful landscape in Coron, it’s really hard to miss out the view. Throughout my boat rides, the only noise we can hear comes from the engine of the boat, surrounded by such tranquility, we took our turns to seat ourselves on the bow of the boat and get ourselves treated to the million dollar view of our lifetime. I was looking for photography opportunities when I saw Elaine sitting on the bow of the boat immersing herself in the beautiful works of nature, that was a postcard picture I had wanted. With the combination of the gorgeously blue sea water and the clear blue sky, I took a shot of Elaine in her own wanderlust dreamland.